OK – one sentence on the weather – The weather has not changed for the good it is now 100 degrees and heat index running from 105 to 109 and this ole’ lady has finally thrown in the towel as far as walking goes for this week. Now on to quilting! I have (again) caught up with Circa 2016 blocks from the 29 July and 5 August! YEA. I really do enjoy making the 3 1/2″ blocks. They go fast and are always a challenge because of the size. To me this is a “practice” session preparing me for some of the quilts that are waiting in line for me to make. This summer the Margaret Potts group from BAS have 3 blocks to work on. I have finished 2 Blocks and working on the 3rd. The last block has 4 stars and I am using the EPP method to make them so they will be “perfect” (Ha Ha). The pieces are so small so I had to set it aside and complete the other blocks. I took one look at the circles and thought – OH NO! So tiny – no bigger than a dime!!! But I started on the block and begin to enjoy the process. The stems are embroidered with 2 strains of variegated thread. I thought I would share with all on how I do my circles. I have 2 sets of Karen Kay Buckley mylar circles, but the time it takes to cut the fabric, baste around the circle, and then spray with sizing and iron, that I decided to take a different approach when making circles for my applique projects. I use C. Jenkins Freezer Paper Sheets Here from Amazon. The paper is 8 1/2 x 11 and the pattern prints out great onto the freezer paper. It is a little expensive, but the time saved is worth it. I copy the pattern onto the paper and then cut out the pieces. On larger patterns I have to be a little more creative, but for this project it is great as the blocks fit on the paper size just fine. I am sure one could cut regular freezer paper and feed it through the printer, but then that takes time to do that. (Maybe I am spoiled or getting lazy in my old age! LOL). I still use Karen Kay Buckley circles, but only to trace around the template like I do with the freezer paper. Here is how I prepared the small circles for the circle block above. As always, the pattern is traced on the background fabric for placement purposes using a light box and number 2 pencil. I really thought I would have issues with the small (dime size) circles, but after working on two or three, it became easier, and besides, that is what ripping is all about when doing hand work. It is not permanent and corrections can easily be made. I have given up on Dear Jane. I studied it, thought about the paper piecing, and decided that I have other things I want to work on the remainder of the year and making a quilt using paper piecing technique is not for me at this time! I have a lot of hand work waiting in the wings to be appliqued and those should go fairly quickly (maybe by September). 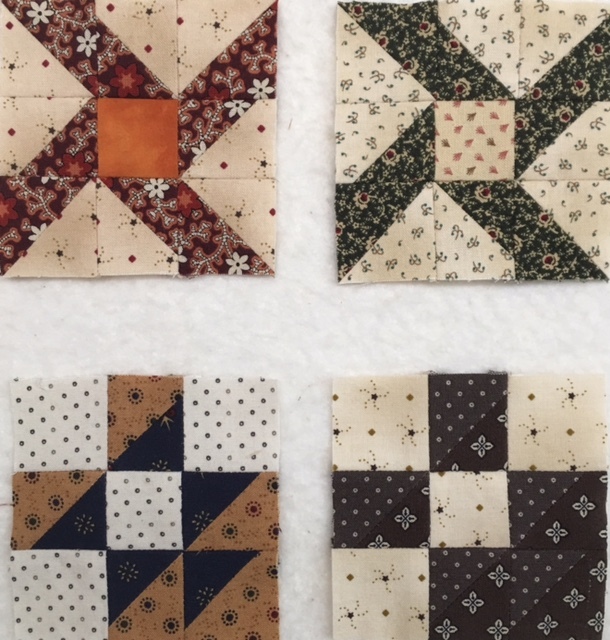 I have Blocks 5 and 6 prepped for Bountiful Life, 7 more blocks for Segment 4 of Stonefields, and lots of lovely hexagons to sew together for Brinton Hall quilt. For piecing projects I went through 5 different patterns and finally chose to make Dresden Heaven by Susan Marth. It has mini and tiny dresden plates and such a fun project. I finally found a pattern that I can use my 1930’s fabrics that were originally intended for the Farmers Wife… so I am happy about that, but it will take a few other projects to use all the fat quarters I purchased. The 1930 fabrics are not my favorite colors, but I thought that they would look good using this pattern. This will be a fun project and one that I can cut out the plates and sew at my leisure, remember I am supposed to be quilting on the long arm… if only I would stay away from chicken noodle soup from the can that has MSG! I have so many notes on the refrigerator now that say “do not eat” and if only I would remember to read them!!!!! Oh well. I hope that everyone has had a great day and continue to enjoy your stitching. Fall is just around the corner – 30 to 60 days! Sometime within the next 30 days or so I will be relaxing in the RV, visiting the Choctaw Casino, and 2 wonderful fabric stores. I need to complete some projects to justify the fabric expenditures! 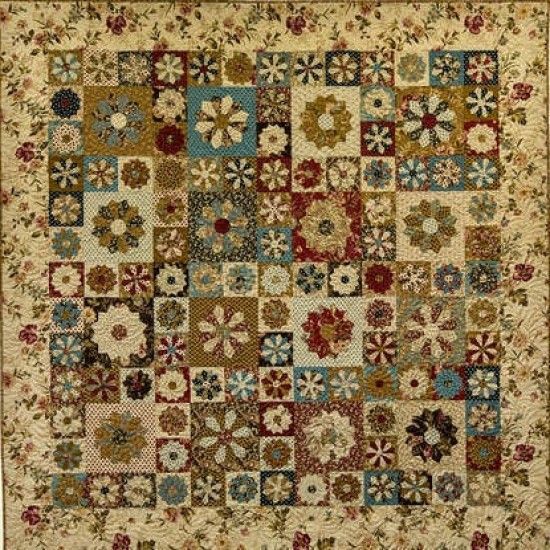 This entry was posted in Quilting and tagged Circa 2016, Dear Jane, Making Circles for Applique, Margaret Potts BAS Project, Susan Marth, Suzn Quilts. Bookmark the permalink. ← Brinton Hall is coming along! I hope you enjoy making the tiny & mini Dresdens as much as I do! My favorite things to use are Mary Ellen’s Best Press before I even cut the strips then again once the plate is made, Roxanne’s glue in the accordion bottle and 1″ & 2” circle cutters for the freezer paper centers. Good luck & can’t wait to see the finished quilt! Well, as you know, I am a “not any glue or starch here” appliquer and quilter. I am not having any issues with my fabrics – the tiny ones are coming out great! I have one done but need to sew the circle down then I can blog the progress. I do not do Roxanne anything….. personal history there. Not my favorite person. But there are many who love her stuff. Not sure what Mary Ellen’s Best Press is – will google it and see all about it. The variegated thread for the embroidered stems is a good idea. The Dresden blocks look a bit challenging. They look busy in the sample shown so hard to tell how each is constructed and how they actually look. The pattern color is too dark and busy for me. I have been wanting to use up the ’30s fabric and this is going to work out great. Susan’s templates work great for them. I also have all of Marti Michell’s templates but Susan’s are different and smaller. So far so good. I have never made tiny & mini quilts. How did you get started on ones so small? I ran across Susan’s blog and found her patterns. She has 2 templates that she sells and I purchased them (like I needed them – LOL), but they are fine and makes it very easy to cut them out! I will check it out. I don’t know if I have the patience for something so small. When I started making the small blocks – 2 inches to 4 inches I too thought I would not have the patience, but I really do relax when making them. The templates make it so easy to cut them out and sewing them is very fast, but one has to sew slow stitches. The instructions are great and provide visual and written instructions! I like the Potts blocks (must start mine) and the little Dredens are fun. You are a busy lady but it is too hot to be outside. Sew away. When you get yours done I will post them! I am trying to think where we could go for the winter (no Arizona). Maybe this year we will have a cold one…..
Getting there on the quilts. I thought I would not like doing the “tiny” dresdens, but they are fun. There are 12 large or mini dresdens in this quilt – today I am cutting out the “tiny” using Susan’s templates. Being a good girl – tired of having bad days. You have very exciting projects in the works! Being an appliquer I especially love the Margaret Potts quilt form BAS. The colors you are working with are just great. I went back thru your blog as saw some of the others. Please show us a grouping-as Cheeky Cognoscenti said to me-the whole is greater than the sum of the part! I have a question as to your circles. i use karen’s circles which are great but circles are a hassle to make with the basting , starching, and ironing. However, I don’t follow your technique: after you have printed and ironed on the freezer paper templates, do you iron and starch the circles? How do you proceed from there? If I am copying a pattern on a sheet of the freezer paper I cut out the pieces to be appliqued. For the circles I prepare them as shown, then I use one applique pin (I use the ones with the white glass heads) for placement and take the first stitch. I do needle turn applique, so I do not use glue or starch as so many are doing now. After the first stitch I will work around the circle using the mark on the fabric and matching it up with the pattern that I had traced on the background fabric. I am noticing that most appliquers now use the starch and glue method and have every piece perfectly glued in place and then applique. That is not how I applique. I do not want to have to wash a block to get the starch or glue out of the block. I do my applique the old fashioned way – I work the piece with my needle. When I show a quilt in a quilt show I have to compete with those who use that method compared to my needle turn applique technique. I am self taught using Anita Shackleford’s book Cutaway Applique, and Elly Sienkiewicz’s book. I started watching Alex Anderson on PBS in 2000 when she had such great designers on and Robyn Pandolph was the one I really followed for applique. I started quilting after I retired in 1999 (never had time for hobbies during my career). I perfected the applique and worked on my embroidery and then in 2004 I started piecing quilts. I love it all. But most quilters now like to do things quickly and so much is being lost in the traditional methods. I do believe they will come back someday. Let me know if you need visuals, I will do that and send them to you. Thanks for the suggestion and there are so many more blocks to do on Ms Potts but when I finish the last of the 3 I will post the ones that I have finished!